A contingent of 50 athletes and their coaches will be wearing Brook Brothers, Paul & Shark and Asics, as Malta will be participating in this year’s edition of the Special Olympics World Games which will be held in Abu Dhabi. These three brands are all being represented in Malta by DIZZ Group and the company is honoured to support the Maltese athletes as the UAE’s capital will stage the most unified Special Olympics World Games in the history of the Special Olympics. 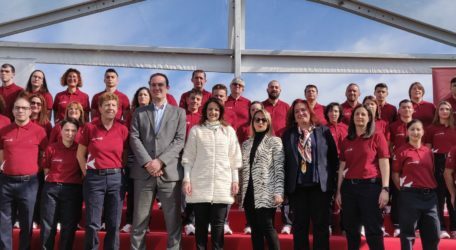 These games will be played from March 8 to 22 and the Maltese athletes have been training intensively for the last eighteen months and are now ready to face the challenges that await them. These athletes will participate in athletics, aquatics, bocce, bowling, unified bowling, golf, gymnastics, cycling, triathlon, and table tennis. DIZZ Group CEO, Diane Izzo will be travelling with the local contingent to Abu Dhabi to support and cheer the Maltese competitors. Moreover, she expressed her gratification at the fact that Malta’s largest retail company is once more supporting local sports. In 2018, DIZZ Group had supported the Maltese water polo national team at the 33rd LEN European Championships which were held in Barcelona. “DIZZ Group truly believes in strong corporate social responsibility through which communities and organisations can benefit. We are committed to supporting local sport and this is being confirmed by the fact that the Maltese contingent at this year’s Special Olympics World Games, will be sporting three of our international brands being Brook Brothers, Paul & Shark and Asics. No doubt we are delighted and honoured by this collaboration with Malta’s largest sports disability NGO, Special Olympics Malta. I trust that these type of sponsorship agreements, local companies such as the DIZZ Group, can contribute to the development and progress of local sports, particularly on the international scene,” said Diane.